Recently the Brenner clan descended on Pittsburgh to pay our respects to my Mother’s brother who passed away last month. Uncle Jim was only sixty-four, which made this unexpected loss feel all the more premature and painful. And that attitude sums him up. For while dealing with his own health issues and his flailing niece, he always maintained a humorous, upbeat outlook. I look back on that visit with such fondness. It was a welcome change of pace for me, and I got to spend time with a generous, big-hearted soul. 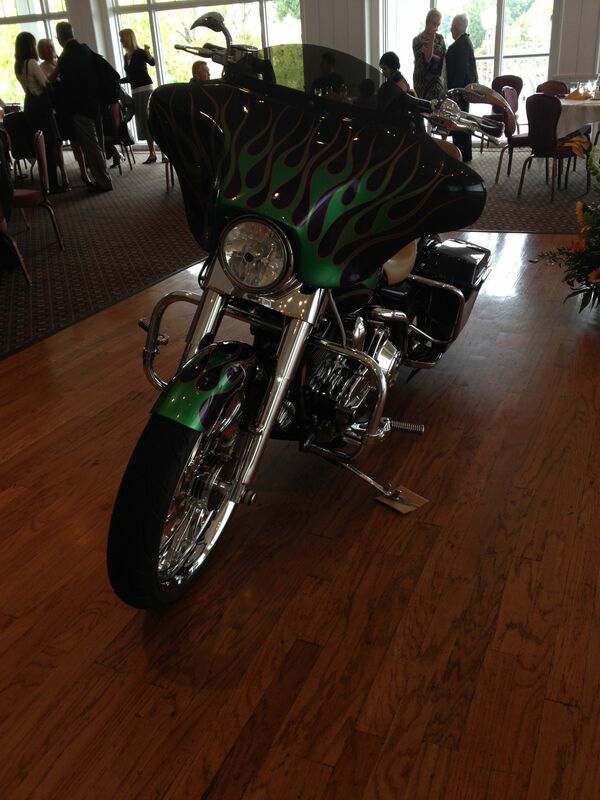 I also made note of the gorgeous custom-made Harley Davison that occupied his Florida garage. I think the thing Uncle Jim looked forward to most after recovering from his surgery was being able to ride his cycle again. 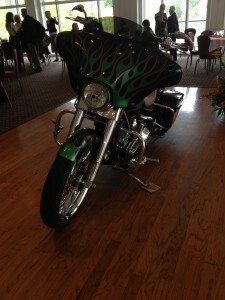 So it was only fitting that my cousin Jimmy made it a priority to have that cycle at Uncle Jim’s memorial service in Pittsburgh, which took the form of a brunch at Jimmy’s country club. Obviously, transporting the cycle from Florida to Pittsburgh required some serious logistics. The bike had just been sold to a four-time Purple Heart recipient who had served in the Vietnam War (fitting since Uncle Jim often participated in bike rides for our veterans). Toby, the man who built the bike for Uncle Jim (and who was also a good friend of his), asked the vet for permission to bring the bike up to Pittsburgh. Thankfully, he got the okay. So Toby transported that beautiful machine 1,051 miles so it could be placed on the ballroom dance floor of Cousin Jimmy’s country club. But the greatest moment came as the brunch was wrapping up. People were saying their goodbyes and Toby was preparing to take the bike back down to Florida. Jimmy conferred with Toby for a moment and then approached the microphone for an announcement: “I’m about to do something that may get me kicked out of this club.” We all waited in anticipation. 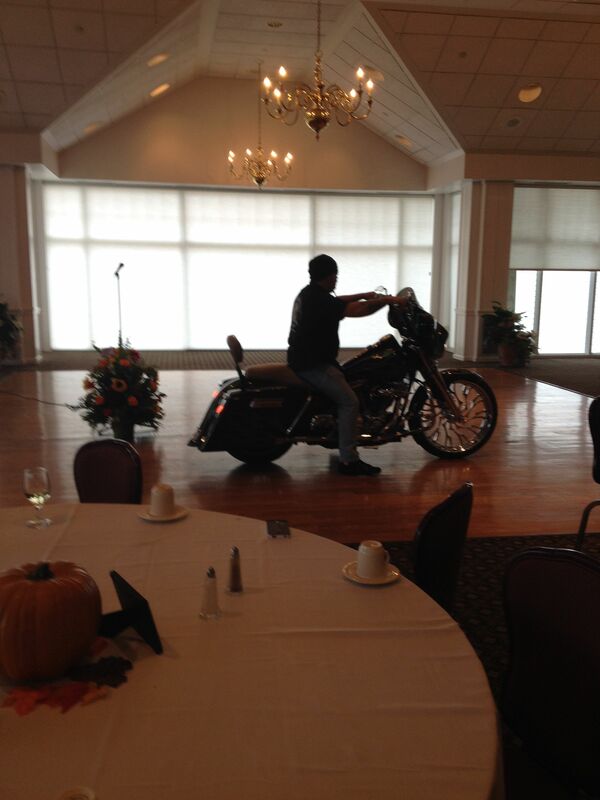 “Toby is gonna ride this bike out of this ballroom. 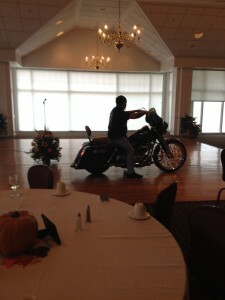 And sure enough, Toby mounted Uncle Jim’s cycle, fired it up, and steered it over the ballroom’s parquet floor, down the club’s tastefully anointed hallway, and out the massive front door. What a thrill to witness! And no one in the club seemed to mind. Not the ladies celebrating a baby shower in a separate room. Not the club’s manager and waitstaff who had provided us with such a wonderful, celebratory afternoon. And certainly not those of us who loved Uncle Jim. It was one of those amazing, spontaneous life moments that kind of takes your breath away. And, as a writer, my immediate instinct is to think, “I need to put this in a script.” It was a great reminder of all of the surprising inspiration around us. And a perfect tribute to Uncle Jim. What a great moment! May Austin be the best ever… wish I was going to be there. Kisses to L and S from me. You brought tears to my eyes. Will Jimmy see this? Aw, thanks, Pops! I actually made sure Jimmy & Craig were okay with this entry before I posted it.